Don’t forget your CLPs—seriously, don’t! Just a few short months are left of the current AAW continuous learning two-year cycle, which runs Oct. 1, 2016 – Sept. 30, 2018. Keep the push on to hit all 80 CLPs by the end of the cycle. Be sure to review the Continuous Learning Policy for guidance on how to fulfill the continuous learning requirement and ensure that each opportunity is recorded in your Individual Development Plan to receive credit. And don’t forget that Engineering and Life Cycle Logistics acquisition career fields now have recommended training to complete those CLPs. Coming soon! DAU is rolling out a new learning management system called Cornerstone on Demand (CSOD). CSOD will replace ATLAS, the current DAU virtual campus, and is slated to go live by Sept. 30. CSOD will improve student enrollment in DAU web training. Please visit the ATRRS/AITAS bulletin board for the changes. Congratulations to the 20 applicants accepted into the groundbreaking Systems Engineering Non-Resident Master’s Degree program at the Naval Postgraduate School in Monterey, California, for the 2019-2020 academic year (cohort 311-191). Required documents were very useful in determining the selection and ranking. SRPEs and command endorsements were useful in making informed decisions on potential and leader support. Strong performance and recognized leadership potential, acquisition work experience, associated significant accomplishments, and appropriate civilian education and training were highlighted. Organizations clearly defined applicants’ career goals and post-program utilization plans. The Acquisition Leadership Challenge Program announcement for the first quarter of FY19 will be open Aug. 1-31. Please visit our Army DACM Office website for details on the program and to get your name in the hat for the next fiscal year. 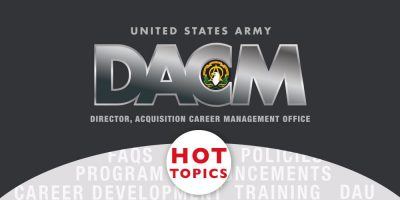 https://asc.army.mil/web/career-development/programs/acquisition-leadership-challenge-program/. The Competitive Development Group/Army Acquisition Fellowship Program is accepting applications for Year Group 19. The window is open from July 30 through Dec. 13, but don’t wait! 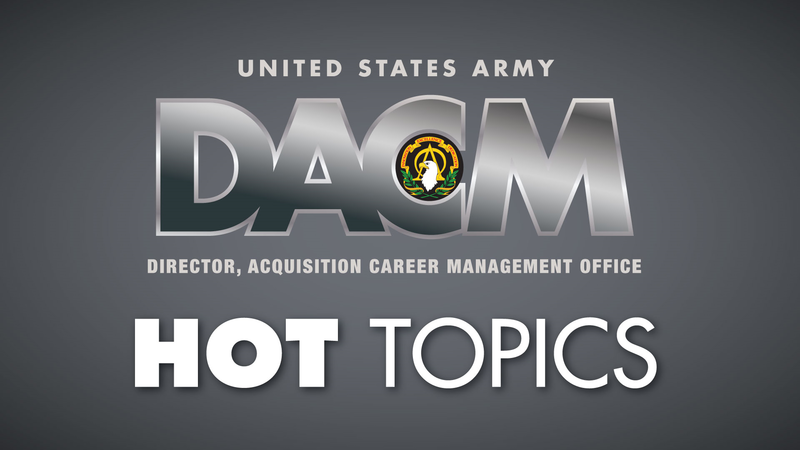 Find detailed program information at https://asc.army.mil/web/career-development/programs/competitive-development-group-army-acquisition-fellowship/. Defense Acquisition University Senior Service College Fellowship will be open for applications December 3, 2018 – March 29, 2019. For the first time, the program will be conducted at Picatinny Arsenal, New Jersey, in addition to the existing sites of Huntsville, Alabama; Warren, Michigan; and Aberdeen, Maryland. Spread the word! You can get all the newest acquisition career and workforce information mailed straight to your inbox. Subscribe now.